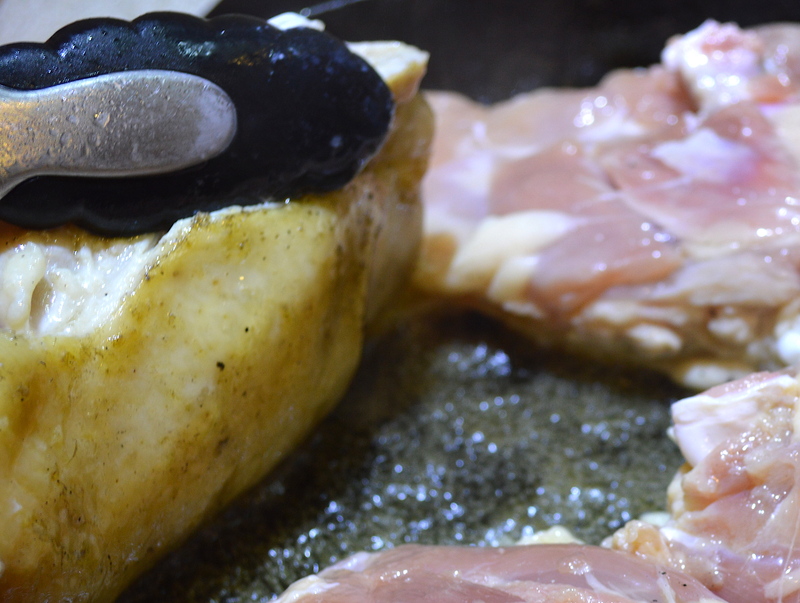 Did you know that cooking in cast iron can increase the iron content of your food? Iron requirements rise significantly during teenage years, especially for girls. 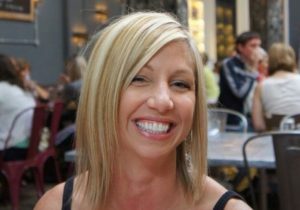 Not only are teen girls at an increased risk for deficiency, vegetarians and vegans are at risk as well. I found a mouth-watering cast iron skillet meal in Bon Appétit: Scroll to the bottom for the printable version of the recipe. Preheat oven to 425º. Gather all tools and equipment. Rinse and dry 6 bone-in chicken thighs and season both sides with salt and pepper. Rub skin side of thighs with 1 Tbsp sesame oil. Set aside. 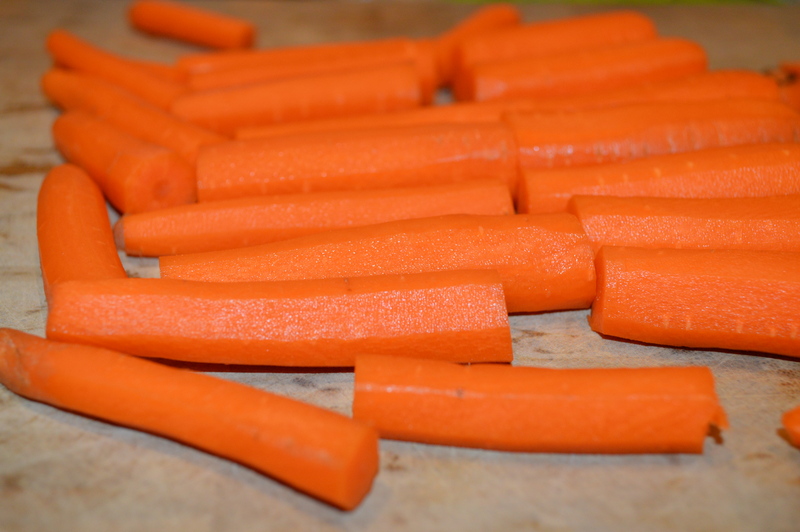 Wash and peel one pound of carrots and cut each into four-inch segments. Set aside. Heat a dry, medium-sized cast iron skillet over medium-low on the stove top. Transfer thighs to hot skillet skin side down and cook, allowing skin to brown before flipping. Rotate the skillet to allow greater distribution of rendered fat for even browning. Cook thighs until meat is opaque around the edges and skin is golden brown, about 12 minutes. Transfer thighs to a clean plate. Pour fat from skillet, but do not wipe clean. Increase heat to medium-high. Add carrots to skillet, arranging so that each carrot piece is directly touching the bottom of the skillet. Allow to cook, undisturbed about 5 minutes. Turn carrots so that charred side faces up. 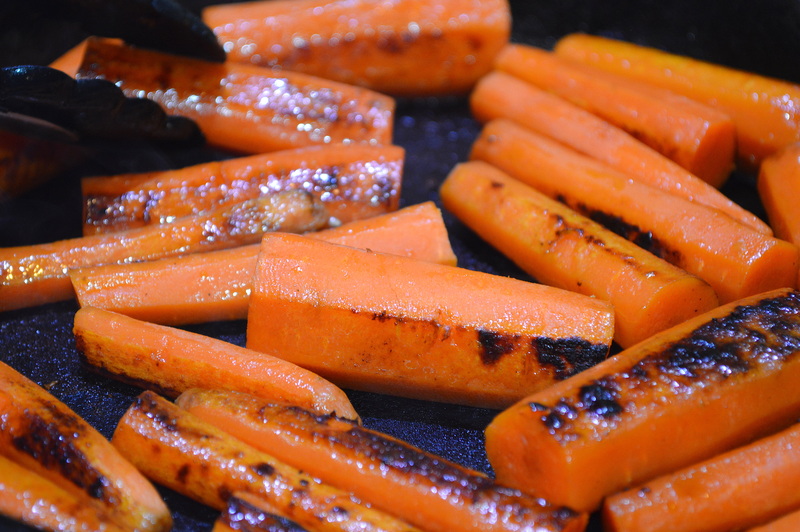 Salt carrots and continue to cook until opposite side is charred, 3-5 minutes. Transfer skillet to oven, roasting carrots about 8 minutes, until fork tender. While carrots roast, combine 2 Tbsp low-sodium soy sauce, 2 Tbsp sriracha, 1 Tbsp rice vinegar, 1 Tbsp honey, 1 Tbsp sesame oil and 1/4 tsp ginger to a small bowl and whisk until combined. Carefully remove skillet from the oven, as the handle will be VERY hot! Arrange thighs, skin side up over carrots and drizzle sriracha soy mixture over chicken and carrots. 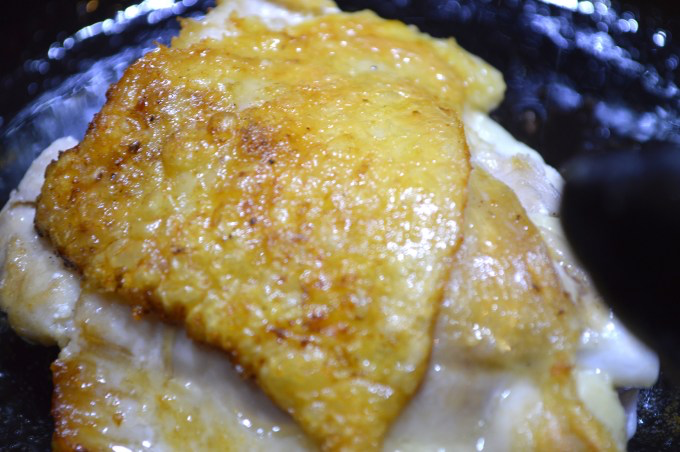 Return skillet to oven and roast until chicken thighs measure 165º with the thermometer placed closely to the bone, about 12-18 minutes. Remove from oven and allow to rest 10 minutes. 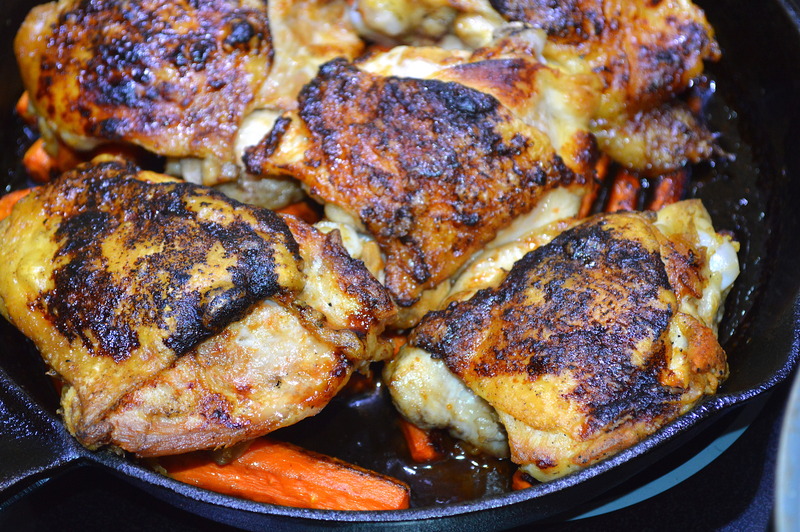 Transfer chicken and carrots to a platter and pour pan juices over. Garnish with sliced scallions and sesame seeds, if desired. For a vegetarian version, use firm tofu instead of chicken. The tofu will soak up the sriracha soy sauce beautifully, in which case you may want to make a little extra sauce. To make extra sriracha soy sauce, use 3 Tbsp low-sodium soy sauce, 3 Tbsp sriracha, 3 Tbsp rice vinegar, 1 1/2 Tbsp honey and 1/2 tsp ginger.